There are certain things in life that are inevitable, particularly that we all change with time. But how do you cope with that? Therefore, the majority centre round the bathroom, and particularly our ability to use a toilet. That includes the last listed ADL: it is one often overlooked, but you need to be able to safely get on and off the WC! Just because it is harder to do those ADLs, does not mean we have to accept the new status quo. Nor does it mean that we have to rely on someone to do those things for us. Today, there is a raft of aids to enable you to carry on life with dignity, safety, and as independently as possible. And they are available whether you stay in your own home, or move into residential care. As we have said before, would you want your partner/carer to wipe your bottom? Increasingly, it does not mean you have to sacrifice style. Manufacturers are appreciating that just because you may need aids, does not mean you need to be ashamed or embarrassed about your bathroom. To an extent that stems from the appreciation that today more people are buying aids themselves (self funding), or having them purchased on their behalf by now grown-up children, rather than relying on provision by the local authority. Something as simple as a grab rail can help with getting on and off the toilet. In fact, many people will use their washbasin as a support- something already there. Just make sure it is appropriately secure to bear your weight. If more help is needed, believe it or not there is a WC equivalent of a riser recliner chair- a toilet lift. The WC itself can be raised, usually via the seat, to further help. 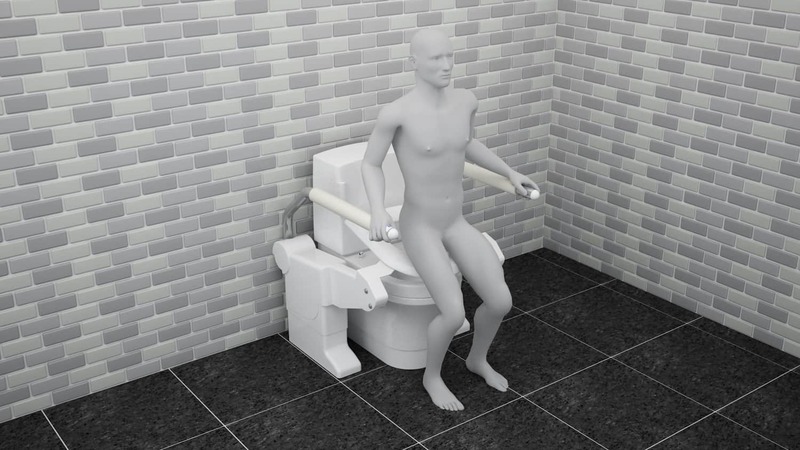 If funds allow, consider replacing the pedestal WC with a wall-hung version, that can be set at whatever height is most suitable for you. You could even “splash out” on the ultimate in WCs: a shower (wash/dry) toilet. This has integrated douching, and some models include drying too, so you don’t have to wipe clean with toilet tissue. The most advanced versions offer various douche options too- pulsing, rotating etc, to ensure you are efficiently and consistently clean. https://tinyurl.com/yad6cdfm (just select ‘try before you buy’ in the ‘category’ drop-down box. – has a team of dedicated, in-house engineers to install, commission, and service. Since it was founded, it has sold almost 70,000 shower toilets, many of which are still in daily use 30 years after first being installed.